The ZLM01 a.k.a. 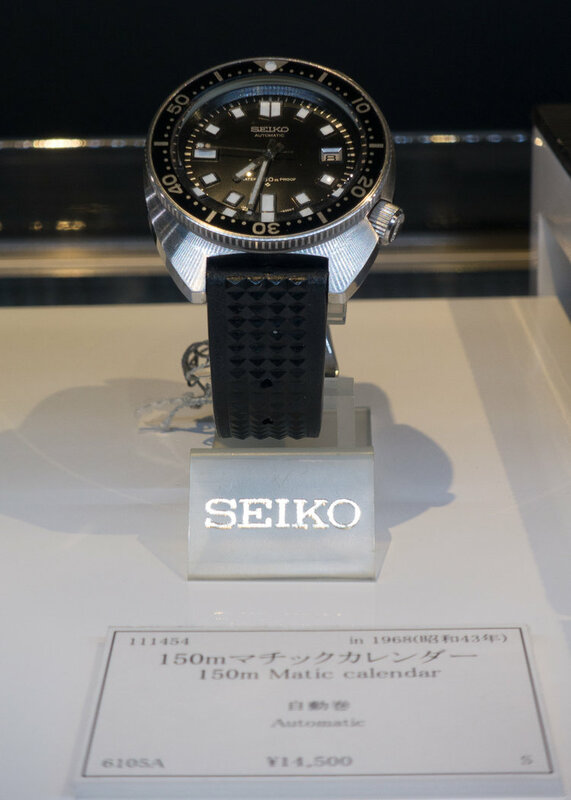 “waffle” was Seiko’s first in house designed dedicated divers strap. 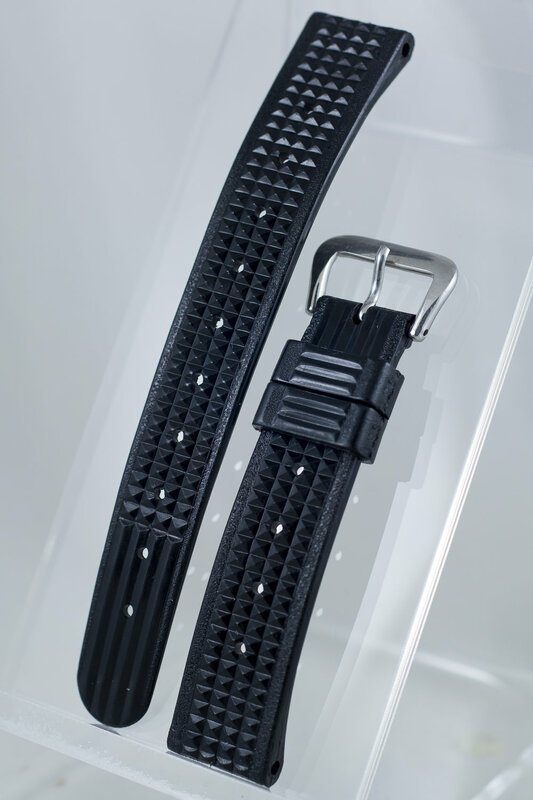 The strap earned the nickname of “waffle” due to the distinctive waffle iron square spiked pattern. 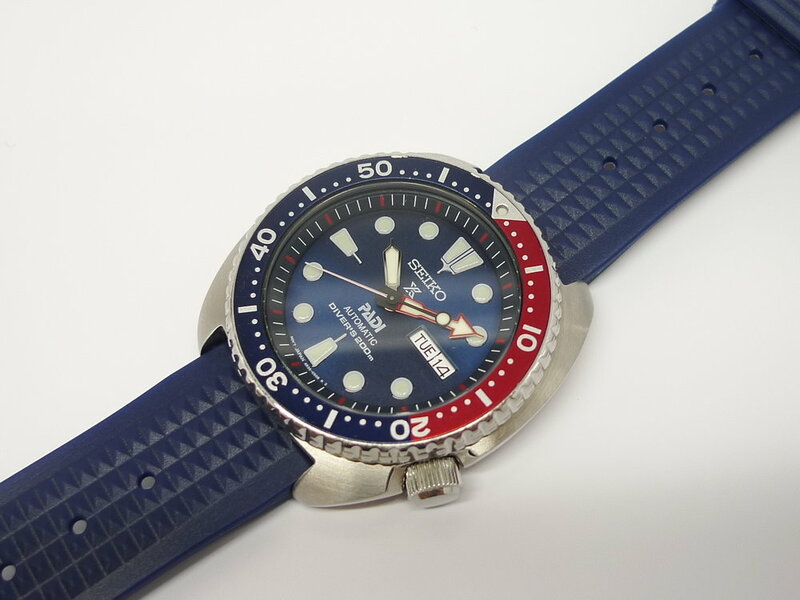 Prior to this strap Seiko had released the 62MAS (6217-8000/1) diver but this watch was supplied on a Tropic strap. For more information on the 62MAS Tropic strap take a look at the article HERE. The ZLM01 was first introduced with the 6215-7000 diver in 1967. 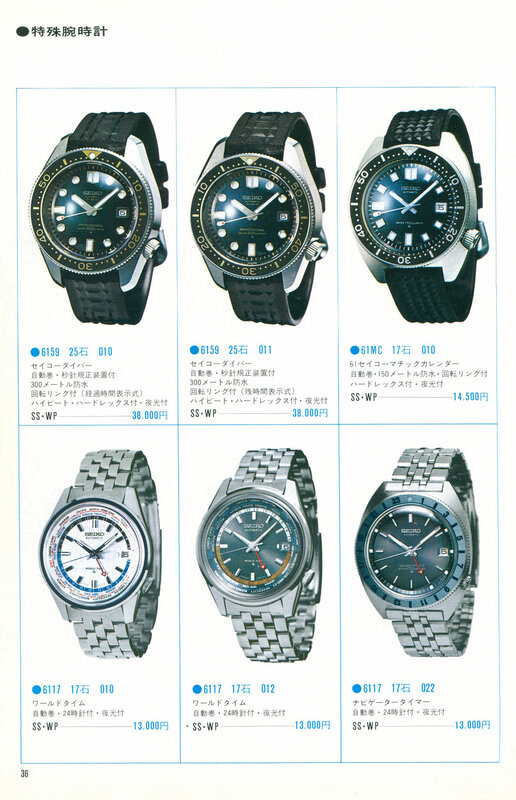 This is first shown in the Seiko Sales June 1967 issue. The watch was supplied with the ZLM01 for the duration of its production run. In addition to the 6215-7000 the ZLM01 was also supplied for a short period of time on the 6159-7000 from it’s introduction in June 1968 until the beginning of 1969. From the start of 1969 the supplied strap for the 6159-7000 was changed to the "Chocolate Bar" design for Japanese Domestic Market (JDM) units. The only other watch ever factory fitted with the ZLM01 for JDM sale was the 6105-8000 from it’s introduction at the same time as the 6159 in June 1968 to the end of its production in 1970. 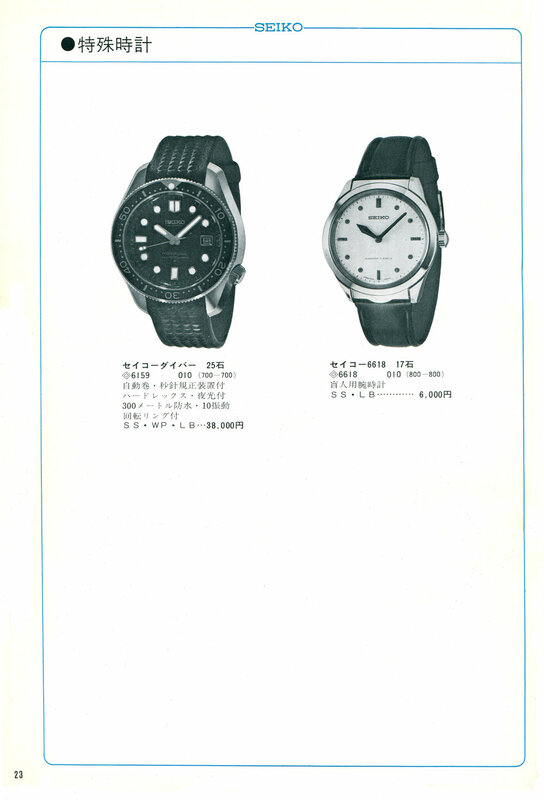 Both the 6159-7000 and 6105-8000 are pictured above in their product announcement from the June 1968 Suwa Seiko internal publication. 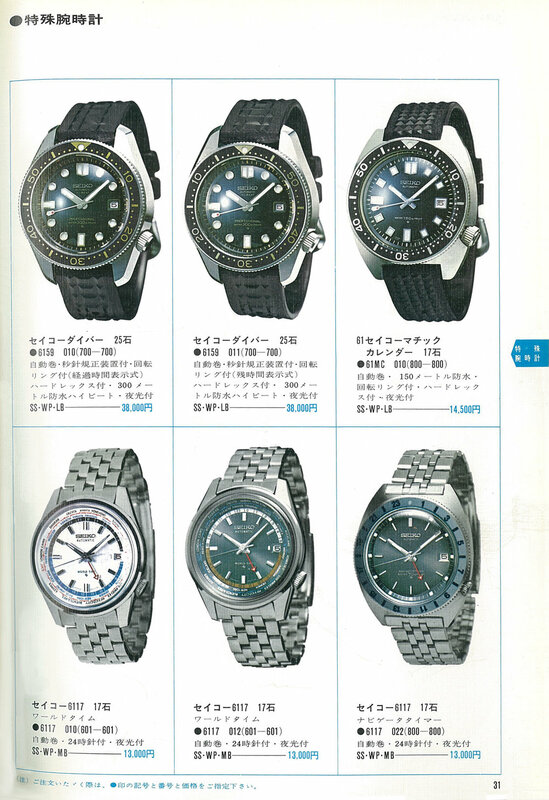 In the international market the 6159-700x was supplied with the ZLM01 until at least 1970 as shown in the Seiko International Export catalog. The 6105-8000 was also supplied with the ZLM01 internationally as shown in the 1970 export catalog. The ZLM01 strap can be seen in the following JDM catalog images. The ZLM01 has the following dimensions. The buckle on the strap can be stamped with just Seiko but others examples are stamped Seiko St. Steel Japan G. I believe that the Seiko only stamped versions are earlier but I do not have definitive proof for this. 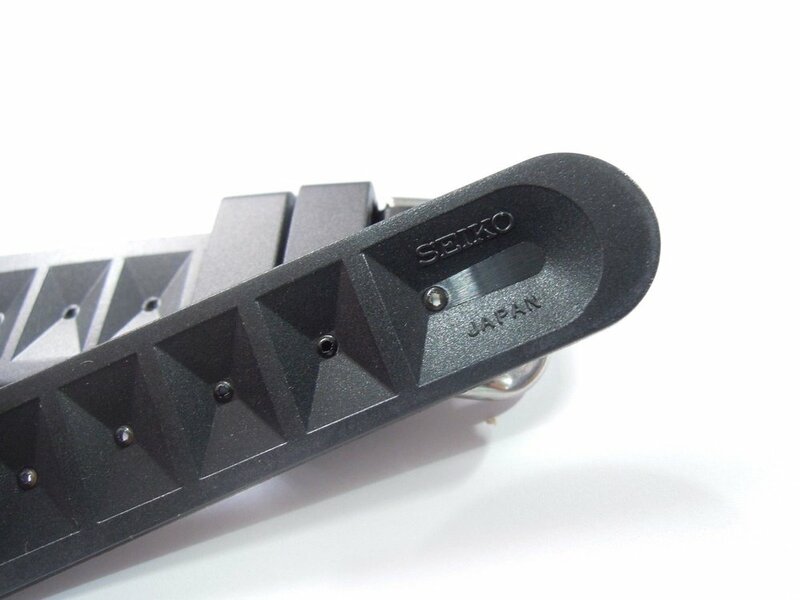 On the inside surface of the ZLM01 there is a Seiko logo and Japan embossed in the tip of the tail end of the strap. Finding an original ZLM01 in good condition is quite difficult as these do not come up for sale often and when they do the price is usually very high. 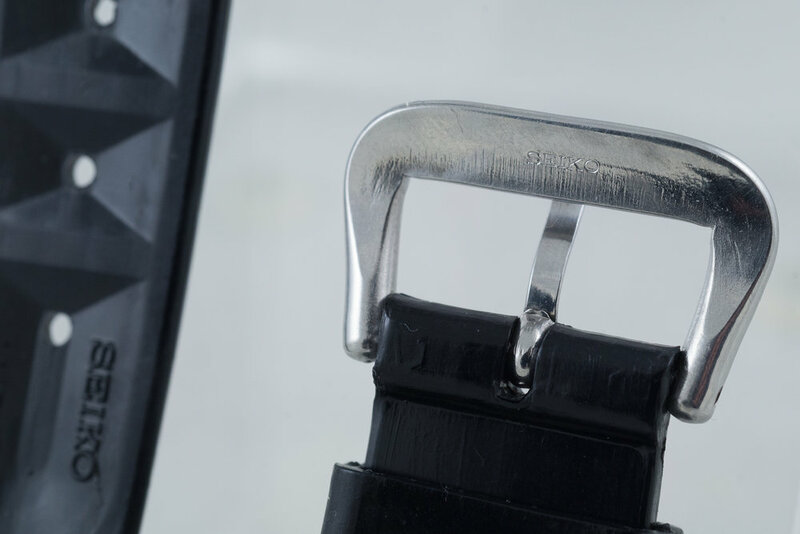 The other issue, due to the age of the materials, is that it is common for the original straps to split or snap without warning and can result in a watch falling to the ground and being damaged. Keep an eye out for splits across the strap as well as between the buckle holes. It would not be recommended to use the original straps for regular use. I decided that due to the potential failure of the strap I would not wear it on a watch and that it would be appreciated more in an environment where many people can see it paired with the correct watch. Consequently the original ZLM01 that I show in the images above now resides on a 6105-8000 watch at the Seiko Museum in Tokyo. Luckily there are a couple of excellent alternatives for people wanting to retain the original look but wear it with confidence. Note: The initial batch (Gen.1) of WJean waffle straps were produced with a Seiko logo and Japan text on the tip of the tail section like the original. This design made the straps difficult to tell from the originals and after feedback from the community the Seiko logo and Japan text was removed. Unfortunately there have been instances of people claiming that the 1st generation WJean straps were actually original Seiko ZLM01’s and people paying a premium for these. Luckily there are a couple of different ways to tell the original from the 1st generation WJean strap. If you are able to see the side of the strap around the spring bar holes you will notice that the moulding seam is different. On the original the line separating the back and front of the strap cuts directly through the middle of the end including the hole. With wear area this can have a few scuffs but still should be quite obvious. On the WJean Gen.1 version there is a step in the mold line. As you can see, when the strap becomes thicker the mold line follows the same thickness until just before the spring bar hole where it rapidly drops down to the center of the hole in a Z shape. Even when fitted to a watch this should be able to be seen in a decent side photo. This is handy as people often will show a close up image of the lugs but not the strap ends. The other way to determine the original version is because the sharpness of the original dies is just not present on the WJean version. If you look at the tail end of the original strap there is a distinct sharp edge to the moulding on the "cross brace" sections on the back side and a defined edge to the bottom lip. In the middle of the strap is a faint central line that can also be seen. On this line there is a small “pip” mark that can be seen on the original strap. The Seiko logo and Japan text on the original strap is also much cleaner when compared to the WJean version. The Seiko text is also slightly off on the WJean Gen.1 version with the S and O characters slightly compressed horizontally. On the WJean version the edges are not as sharp and have a rounded finish. The central line and pip are not present on the WJean version. At the buckle end of the strap the original ZLM01 strap has a flatter surface on the inner side. On this surface there are also a couple of circular moulding marks that are not present on the WJean version. People should also be warned that there has recently been a new strap appear on the market that includes Seiko branding on the rear surface and the buckle end. 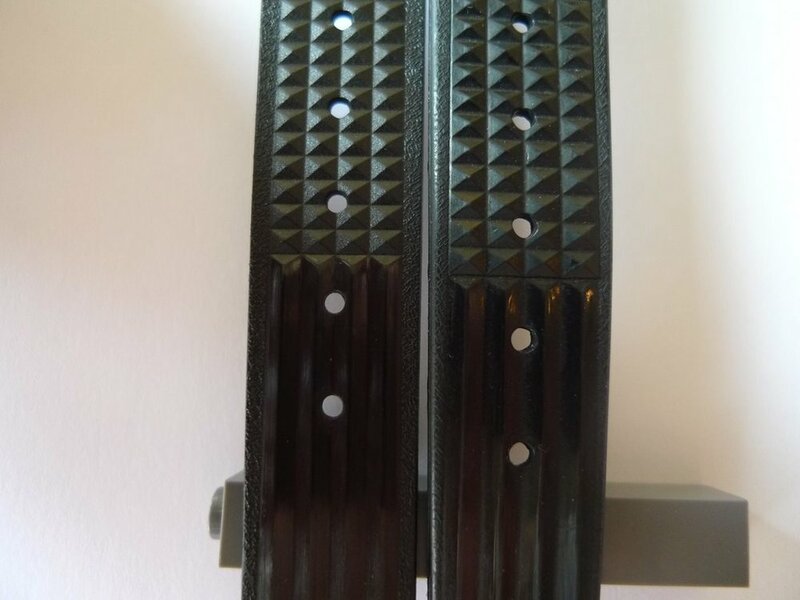 This strap can be differentiated from the original by the poor moulding around the holes and the strap material that has a speckled finish to it. It is disappointing that people continue to produce a strap that has Seiko branding but is from another company. The seller of this strap also sells a range of other Seiko branded straps that have fake Seiko packaging and branding on them. I would avoid this seller as the inclusion of Seiko branding on a third party product looks like it is designed to deceive users and over time these straps will undoubtedly try to be passed off as originals. 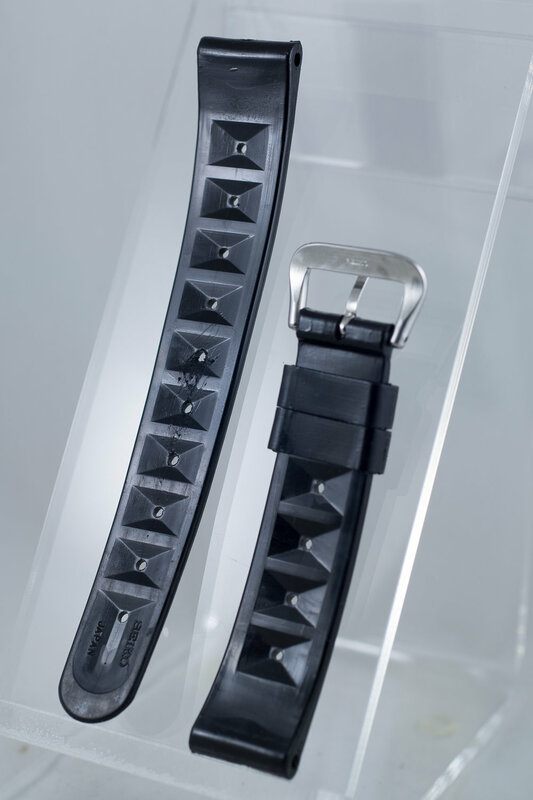 This is a confortable, high quality, well designed strap utilising modern materials. The Uncle Seiko version has a couple of minor differences from the original. The hole spacing is a little different between them and the tip of the tail end is a little longer while the total length of both straps remain essentially the same. This does not really make any practical difference and unless you are holding both straps side by side most people would not be able to tell them apart from the outer appearance. On the inside of the Uncle Seiko strap there is no Seiko logo printed (like the current WJean) so they can be simply differentiated from the original and to prevent people from trying to pass these off as original. In addition to the traditional 19mm version Uncle Seiko also offers the waffle strap design for larger lug sizes. 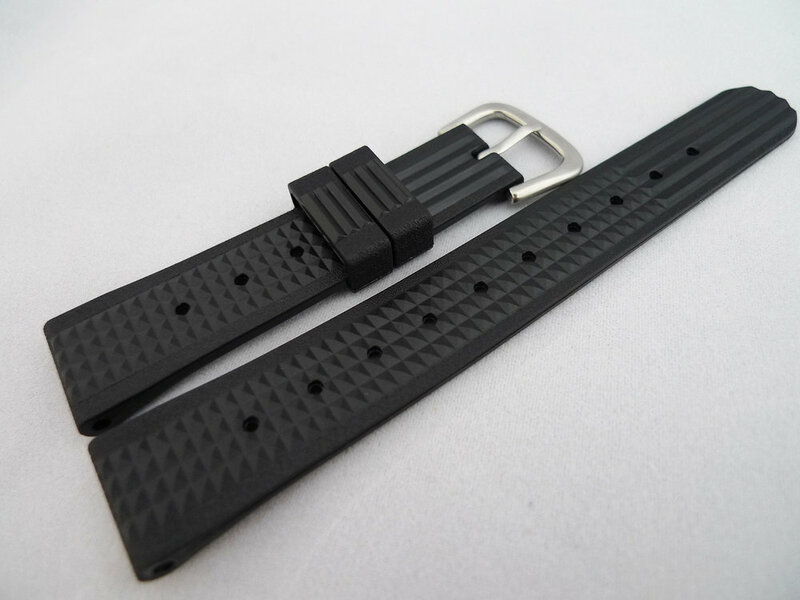 If you like the design of the strap and want it on a watch with 20mm or 22mm lugs this is now available. 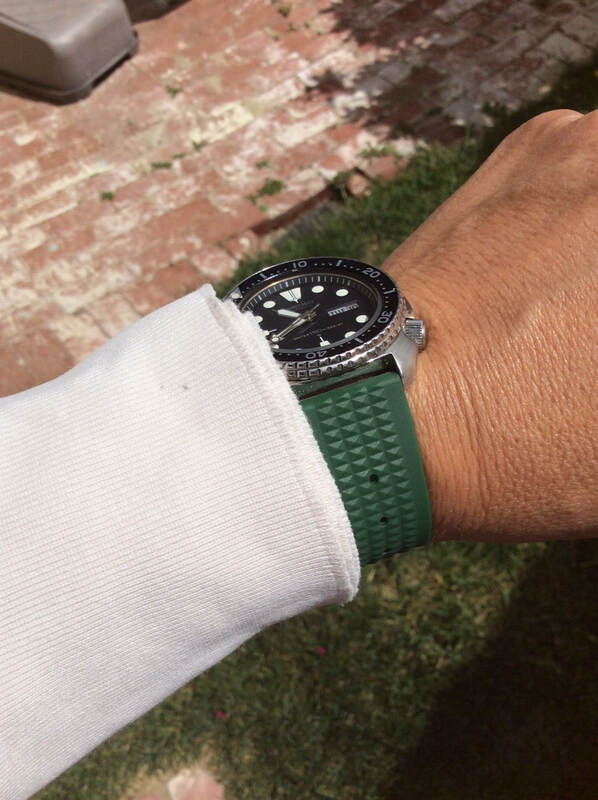 Uncle Seiko also offers the waffle strap in other color variations including blue, green and khaki. 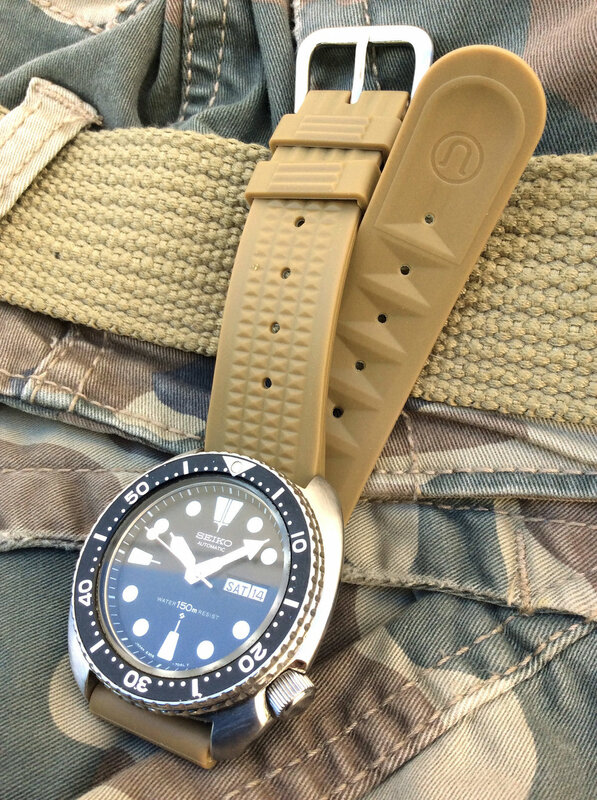 While many collectors will want to obtain an original strap, for everyday wear it is fantastic that there are a couple of different excellent alternatives available to Seiko dive watch owners.